Alex Trebek: The greatest and yet most ridiculous vegetable of all time. Me: What is spaghetti squash, Alex? 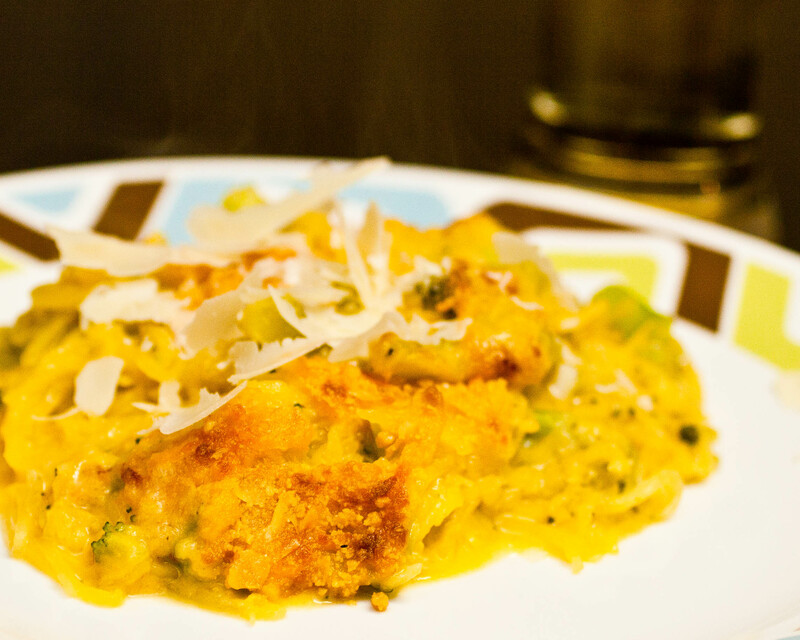 But really, spaghetti squash is phenomenal. Minimal calories, great texture, and it tastes awesome! You can use it as a replacement for pretty much any noodle, and it works perfectly. 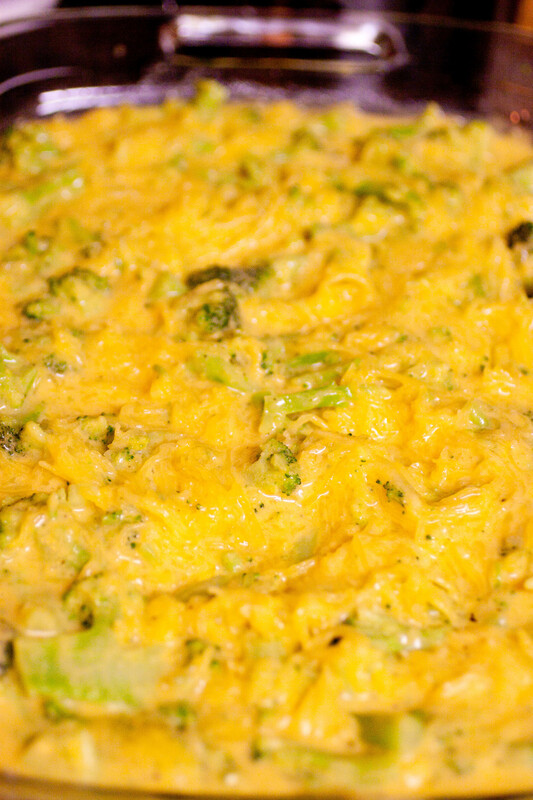 Baked mac and cheese with broccoli was always one of my favorites (and my signature recipe/dish) before I had to go gluten-free. So I am continually searching for alternatives that don’t involve the surprisingly unhealthy gluten-free pasta. And I’ve found it. So parents…I’ve solved your “kids won’t eat the vegetables” problem. 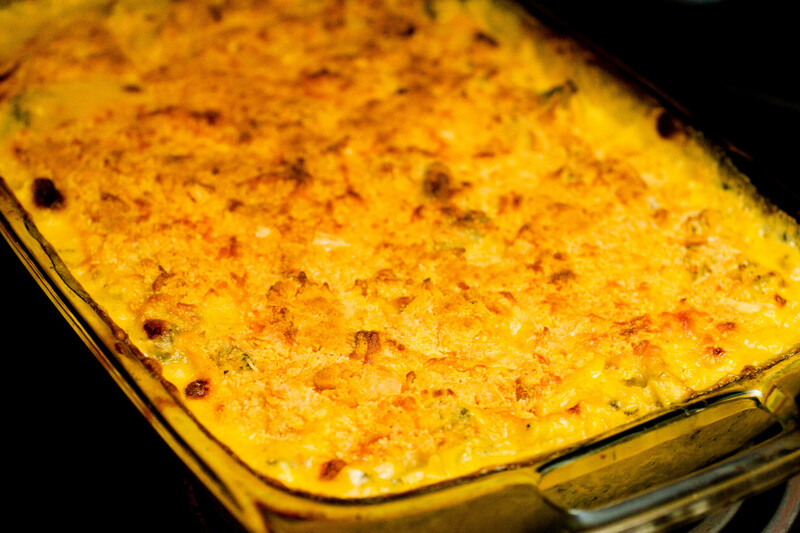 This is a kid favorite…mac and cheese…made of vegetables. 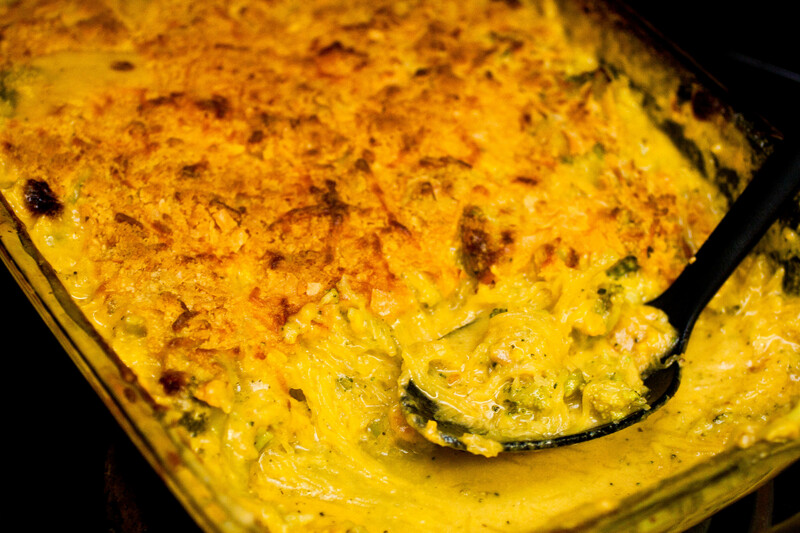 I ate enough for a small horse (aka Great Dane), and I think anyone else who loves mac and cheese with creamy sauce and crispy breadcrumb topping would do the same. And did I mention it’s gluten-free? Preheat oven to 375. Prick the outside of the spaghetti squash several times with a sharp knife or fork on all sides. This will prevent the squash from exploding (I made that up just now…but you should still make those little holes). Place squash on a cookie sheet and throw it on the middle shelf of the oven. Bake for 1 hour 20 minutes, flipping the squash once halfway through. Leave the oven on after you take out the squash. Once the squash is baked through and soft, cut it in half lengthwise. Use a spoon to scoop out all the goopy pulp and the seeds that are in the cavity of the vegetable. When all that is gone, grab a fork and scrape the sides of the squash to loosen the “noodles.” Place these noodles in a large bowl. You can scrape all the way down to the skin and still get these crazy noodles. Set aside. Mix milk and oat flour in a saucepan with a whisk until smooth. Heat over medium, stirring regularly so flour doesn’t build up. Add the garlic powder, basil, and pepper while stirring. Bring to a boil for one minute, then reduce heat to simmer and add the 2 1/2 cups cheddar cheese, stirring until melted. 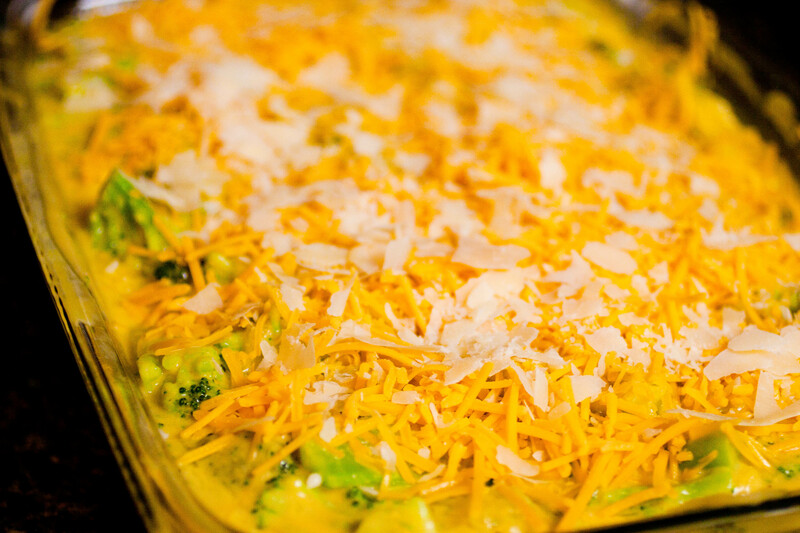 Add the broccoli and the warm cheese sauce to the bowl of squash noodles and mix until everything is well-coated in the sauce. Transfer to a 13 x 9 baking pan. Sprinkle the remaining 1/2 cup shredded cheddar over the top, along with the 1/4 cup of shaved parmesan, then the 1/4 cup of gluten-free breadcrumbs. Pop in the oven at 375 for 30-40 minutes, or until bubbly and brown. If your cheese sauce is bubbling, but the top does not look brown, switch the oven to Broil on High for about 3-5 minutes until the top is brown and crispy.